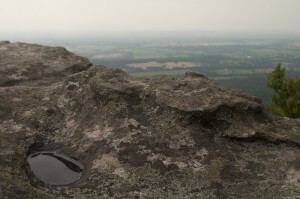 Home » Appalachian Trail » Rocky Surface on the mid-Atlantic States of the Appalachian Trail. Rocky Surface on the mid-Atlantic States of the Appalachian Trail. “Pennsylvania rocks,” is the old Appalachian Trail joke. Of course, it’s not entirely a joke. Every one of the 14 states on the Appalachian Trail is renowned for one thing. For example, New Hampshire is renowned for its difficult White Mountains, while Maine’s ethereal beauty if frequently extolled. The mid-Atlantic states represent a sort of ‘root-canal’ phase of the Appalachian Trail. Thru-hikers traditionally pass through these low elevations in mid-summer, when the bugs and humidity are at their worst. Adding to this existential test are the rocky surfaces of the mid-Atlantic states. Pennsylvania is most renowned in this regard, with its seemingly endless fields of short, sharp stumble stones. But there are also large boulder fields that find hikers taking to all fours to traverse. New Jersey (also renowned for its bears) and New York also feature their share of dry, rocky stretches that are sure to test a thru-hiker’s morale. The silver lining is that thru-hikers will have plentiful tales of hard luck and struggle once they complete their journeys in the fall in Maine. Good luck and happy trails! Bill Walker is the author of Skywalker–Close Encounters on the Appalachian Trail. He is also the author of Skywalker–Highs and Lows on the Pacific Crest Trail (2010), as well as The Best Way–El Camino de Santiago (2012). Walker, who is just shy of 7-feet tall, is currently working on a whimsical book on the subject of height.